Specialized in manufacturing brass faucets, Flush valves, plumbing products and bathroom accessories. My customer is very satisfied with your sample, now we place an order with you. The quality and service are good, delivery time is punctual every time. We have cooperated more than ten years, thanks for your support. Wish you good business and Happy new year! Suitable for connecting interface for G1/2 inch tubes. rotary switch.High purity brass main body, resistance costing. 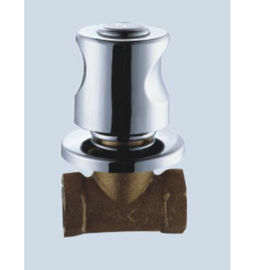 single hole wall-mounted installation .Ceramic cartridge,Quality guarantee time:5 years no leakage. 2)The temperature is no more than 85° when supply hot water. 3)Don't use vapor when supply hot water. 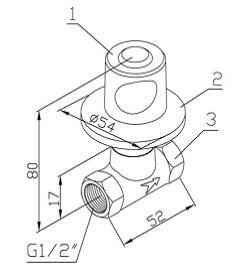 6) Please don't connect the inlet and outlet connector inversely when install the valve body, the direction of the arrow showing on the valve body ③ is the direction of flow. Shenzhen King Of Sun Industry Co.,Ltd. It is a professional enterprise specializing in producing and marketing of faucets, sanitary wares ect. Head office located at Shenzhen, Luohu District, nearby Hong Kong. Factory is in Heshan, closed to ShouKou town, Kaiping city. It is a faucets production base in China, famous for its excellent quality. We adopt gravity casting equipment to assure the density and uniformity thick of pipe. CNC processing equipment to assure the product’s Processing precision and using life. Advanced environmental protection electro-plated technology to prevent its second pollution, supply you more pure water and brightness is new even if it was used a long time. Our design combined with European advanced concept design, Fully consider for consumers, Focus on the use of consumers feeling. We have passed ISO 9001:2008, All produced "handy" products sell to Europe, South America, Sothern Asia and so on. "handy" products will continue to create novel and applied items that will lead the market to all customers in the world. Please enter the inquiry details, such as product name, color, size, MOQ, FOB, etc. China good quality Basin Tap Faucets supplier. Copyright © 2012 - 2019 basintapfaucets.com. All rights reserved.